A picture of a little Syrian boy has gone viral, destroying faith in humanity, even though the photo itself is a few years old. However, the story might still be actual and proves just how bad things are in some areas of the world and how much suffering people have to go through. It’s really heartbreaking! The image itself, which can be seen below, shows a little kid holding his hands up, with teary eyes and terror easily seen on his face. He “surrenders” to the photojournalist taking a photo of him, thinking that the camera is actually a weapon. That’s how scarred the poor kids get by the horrors of the war. The photo is believed to have been taken by photographer Osman Sağırlı sometime in 2012 while visiting a refugee camp on the Turkish border. 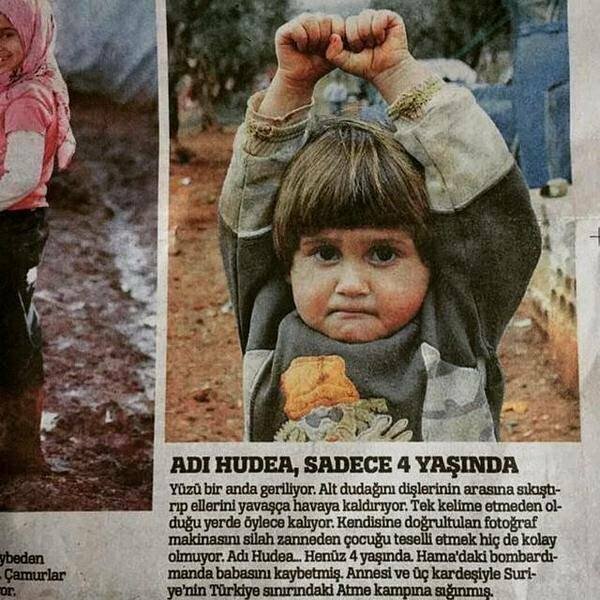 The boy in the photo was 4 years old at the time and became a refugee together with his mother and three siblings after losing his father in a bombing in Hama, according to Turkish website Yeni Akit who posted a newspaper clipping of the story. The short article reads: “His face tightens immediately. He bites his lower lip and slowly raises his hands. He stands still without a word. It isn’t easy to console the child who thinks that the camera looking at him is a gun. Yup, this did bring tears to my eyes. I can only hope that the boy is safe now and put all – or at least most of this – behind him. Previous Post20 Hilarious Yahoo Answers Questions that Will Make You Rotfl Next PostThese Minimalist Movie Posters Made from Paper Are Pretty Spot On!